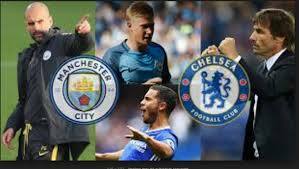 We are heading to the Etihad Stadium in Manchester, where the champion Manchester City hosts Chelsea in a game from the 26th round of the English Premier League. After beating Everton with 2-0 at the Goodison Park during the week, Pep Guardiola’s team once again topped the league, being on par with Liverpool, but having a better goal difference. Of course, Liverpool have a game in hand, so they are still in a pole position for the first place. For Manchester City it was a successful visit to the Goodison Park. Aymeric Laporte opened the score for City at the end of the first half, while in the last minutes of the match Gabriel Jesus made it 0-2 for the champions. Liverpool’s fans hoped that they city rivals will trouble City, but Marco Silva’s team was unable to oppose to City. For the Cityzens it was their 20th win from the start of the season. They already have 68 goals scored in the league. Chelsea on the other hand continue to fight for a Top 4 finish and a return to the Champions League. Right now the Blues are 4th in the standings with 50 points, having 2 points advantage in front of the 5th Manchester United. Maurizio Sarri’s team suffered two consecutive defeats in the league against Arsenal and Bournemouth, before crushing Huddersfield Town with 5-0 at home. In this game Gonzalo Higuain scored his first goals with the blue shirt. Despite of this win against Huddersfield, Maurizio Sarri is still heavily criticized. Many people think that the Italian tactician won’t manage Chelsea next season. We shall wait and see what’s going to happen. That’s what we had to say about the Premier League derby between Manchester City and Chelsea at the Etihad. City will want to avenge their loss at the Stamford Bridge few months ago.